David Lynch has long established himself as one of the most divisive directors in the history of cinema. There are those who get him, and plenty who don't. Known for his abstract stories that often push the boundaries of reality, nothing is ever concrete. Like his approach to painting, his films are a collage of wild imagery set on a foundation for viewers to grasp. Like a half finished puzzle, his films are made to be subjective, leaving much to the viewer’s imagination to interpret. His entry into Hollywood is as unique as the man himself. 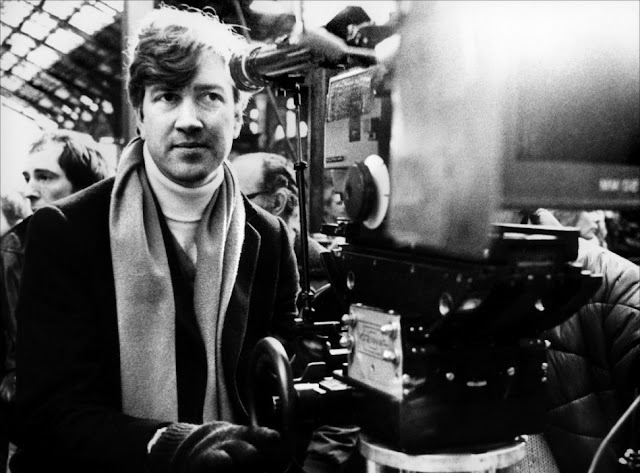 In the late ‘70s, assistant director/ producer Jonathan Sanger acquired the script for The Elephant Man. Written by Christopher De Vore and Eric Bergren, Sanger received the script by a chance occurrence when he was given a copy by his babysitter. At the time, the tale of Joseph Merrick's life was fast gaining interest in the realms of entertainment. Much of that interest could be credited to playwright Bernard Pomerance, who adapted the life of Merrick for the stage. The production became a Tony Award winning play in 1979, with actors Philip Anglim, David Bowie, and Mark Hamill taking on the role of Merrick during its four year run. Having recently worked as the assistant director on Mel Brooks' film High Society, Sager approached Brooks with the script. The famed comedy director had recently launched his own production company called Brooksfilms, and after reading the script, an enthusiastic Brooks agreed to help finance the film. Stuart Cornfeld, who was Brooks' personal assistant at the time suggested David Lynch direct the film. Lynch's only film at the time was the self produced surrealist drama Eraserhead. Despite having any major studio experience, Sanger met with Lynch. After looking over the script, Lynch expressed his interest in directing the film. He began brainstorming ideas on how he would bring the story of Joseph Merrick to the screen. Excited by Lynch's vision, Sanger endorsed him to direct the film. There was just one problem. Brooks had never heard of David Lynch. Both knowing Lynch was the right man for the job, Sanger and Cornfeld arrange a screening of Eraserhead at 20th Century Fox. Released in 1977, Eraserhead opened to little interest and mostly unfavorable reviews. Luckily the film found success as a midnight feature, and after a series of late night screenings, Eraserhead became a commercial success. Much to Sanger'd relief, Brooks loved the film, and enthusiastically gave his blessing for Lynch to direct The Elephant Man. Although there was one condition. Brooks did not want to be credited as executive producer. Being one of the biggest names in the industry at the time, he did not want to confuse audiences who may expect to see a comedy if they seen his name attached to the project. Being an artist of multiple medias, Lynch wanted to be artistically involved in the film as much as possible. He first tried to design the make-up for Merrick but found he didn't have the ability to get it right for the screen. Make-up artist Christopher Tucker was hired to create prosthetics of Merrick’s deformities. He designed the prosthetics using the casts of Merrick's body, which were on display at the Royal London Hospital's private museum. Beside directorial duties, Lynch provided the musical direction and sound design, and helped adapt the screenplay with Christopher De Vore and Eric Bergren. Most of the story comes from the books The Elephant Man and Other Reminiscences by Dr. Frederick Treves (1923), and The Elephant Man: A Study in Human Dignity by Ashley Montagu (1971). Initially Lynch wanted Eraserhead leading man Jack Nance for the title character. The role eventually went to English actor John Hurt. 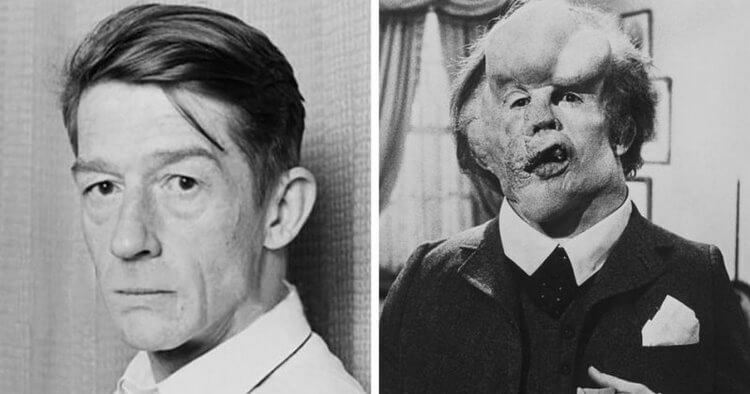 To achieve the authentic look of Merrick's deformities, John Hurt had to sit though 7 to 8 hours of make-up. It was no small feat to endure for the actor. Hurt would arrive on set at 5am for make-up, and would shoot his scenes from noon until 10pm. The removal of the make-up added an additional 2 hours to his day. Due to the strain of the make-up and the grueling 20 hour days, Hurt would only work every other day. He would later describe the role as a "considerable challenge." Enduring the make-up was one ordeal, but trying to act while physically impaired was another. The added difficulties really allowed him to experience Merrick's daily struggles. Despite all the limitations, Hurt was able to convey Merrick's pain and joys through his eyes. To do such a thing was no small challenge, and Hurt dazzled all with his performance. Anthony Hopkins also gave a memorial performance as Merrick's friend Dr. Fredrick Treves. The expected behavior of an established medical professional often strays as Treves gives in to compassion for Merrick's troubled existence. Lynch's decision to film in black and white gave the movie a feeling of nostalgia. It gave the audience the illusion of an age old story, one that mirrored the black and white photos of Merrick. Always the surrealist, Lynch explained that "black and white immediately takes you out of the real world." Lynch made a brief cameo in the film as one on the men that angrily pursues Merrick in the film's famous train station scene. Long time Brooks collaborator John Morris composed and conducted the musical score. The score is often very somber, and incorporates dark carnival theme music throughout the film. What is striking about the music is the echoing feelings of loneliness, mirroring the agony Merrick felt in his isolation from society. In addition to Morris' score, Lynch choose to use Samuel Barber's classic piece Adagio for Strings for the film’s final scene. The moving piece underlined Merrick's death, and Lynch used the heavenly implications from the piece's choral arrangement to set up his surreal ending. The film begins and ends with abstract dream sequences, bookends of nightmares and angelic comfort, both frightening and soothing. When the film was screened for the executives at Paramount Studios, they expressed concerns about the Lynch's opening and closing sequence. Many felt it was unnecessary and too abstract. When they requested it be cut Brooks immediately put his foot down and explained "We are involved in a business venture. We screened the film for you, to bring you up to date as to the status of that venture. Do not misconstrue this as our soliciting the input of raging primitives." The Elephant Man opened to positive reviews. The film received an impressive eight Academy Award nominations, although it came up short in every category. The lack of a make-up category for Christopher Tucker’s contributions caused an outcry across the film community. The category was added the following year as a result. The success of The Elephant Man put a spotlight on Lynch, a spotlight that quickly lead to expectations. It wasn't long before the offers began pouring in. One of those offers was Return of the Jedi. Lynch met with George Lucas but had little interest in directing the film. It already had an established vision and a legion of fans. An artist at heart, Lynch wanted to create his own vision, and wondered why Lucas didn't want to direct the film himself. Lynch eventually choose to direct Dune, based on the 1965 novel by Frank Herbert. There were previous attempts to adapt the novel before Lynch came aboard. Arthur P. Jacobs (Planet of the Apes), was the first to purchase the rights but died before the film could be developed. Director Ridley Scott also spent several months attempting to develop the film. After realizing the massive time commitment, he bowed out to direct Blade Runner. The novel proved difficult to adapt for film. Dune began shooting after Lynch completed his sixth draft. The film was a gigantic Hollywood production. 80 sets were built that required a crew of 1700 people to operate. Lynch’s first rough cut of Dune without post production effects was four hours long. After writing a seventh script, he managed to cut the running time down to three hours, but the studio insisted on the Hollywood standard two hour film. The movie eventually suffered from massive cuts that hurt the cohesiveness of the story, which producers felt was too complicated. This led to the film's voice over narration. Dune was a critical and box office disappointment. Robert Ebert notoriously called the film “a real mess, an incomprehensible, ugly, unstructured, pointless excursion into the murkier realms of one of the most confusing screenplays of all time.” Ebert’s counterpart Gene Siskel was equally harsh, describing the film as “physically ugly,” and “confusing beyond belief.” He closed his review with this statement - “In case I haven't made myself clear, I hated watching this film." There were so many revisions to the film that critics were denied a screening, which is often a tactic studios use when they have no confidence in their film. Dune failed to make back its $40 million dollar budget and all planned sequels were scrapped. Lynch distanced himself from the film after its release. The lack of artistic control and final cut left him feeling helpless in terms of expression. Having his voice silenced left the director with a negative outlook of the industry. In three years he went from being a fresh new visionary to the man responsible behind what many film goers considered the worst movie of 1983. His brief residence in Hollywood did manage to reinforced Lynch’s platform as an artist. To this day he steers clear of big budget films, and prefers to write his own original work. He continues to create as a means of expression. Be it painting, music, or film, he is constantly in the state of development. In his book Catching the Big Fish, Lynch explains “Ideas are like fish. If you want to catch a little fish you stay in the shallow water. But if you want to catch the big fish, you’ve got to go deeper. Down deep, the fish are more powerful and more pure. They’re huge and abstract. And they’re very beautiful.” Never one afraid to explore the darkness, Lynch has made a career for himself on his own terms. He is an inspiring individual that reenforces the core foundations of expression, and all the freedoms that come with it.